Cloth diapering on a budget is definitely possible. I have come up with an informative list of resources to help you find the right options when buying cloth diapers, wet bags, wipes, and more. Now, my first suggestion of shopping during sales is pretty obvious, and the Holiday season is when you will see the best sales. Clearance events will happen more often than you think. The best place to watch for these sales or clearance items is on social media. 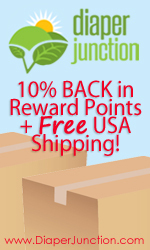 “follow” some of your favorite cloth diaper companies such as DiaperJunction.com, and you will see all of their deal posts in your feed.
. This Econobum kit comes with one size three covers and 12 cotton prefolds. If you need to go even cheaper than the above mentioned, there is always going to be used diapers being sold on Ebay. Some are priced fairly, but a lot of times people are over charging in my personal opinion. A cloth diaper charity such as Giving Diapers Giving Hope is a great foundation. They provide free cloth diapers to low income families to help alleviate the cost of diapering their children, which will help them use their money for other essentials. You will need to apply on their website and read the full disclosure on how it all works here: GivingDiapersGivingHope.com. We used cloth with 4 of our 5 children! I am glad that they are all potty trained but I do miss fluffy shopping!